Frances E. “Granny” Koenig, 100, formerly of Reisterstown passed away on January 30, 2019 at Carroll Lutheran Village in Westminster, where she was a resident for over 23 years. She was born on September 22, 1918 in Upperco, MD to the late Garfield and Annie (nee Beam) Weaver. She was the beloved wife of the late H. Paul Koenig, Sr. who passed away in 1994. Frances worked for the State of MD in the Towson Court House as a clerk in the Transfer Office. She was a devoted member of the Reisterstown United Methodist Church and in 1994 she was named “Woman of the Year”. She was a member of Ionic Chapter #73 Order of the Eastern Star. 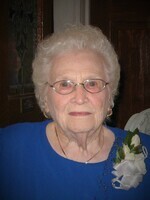 She served as Worthy Matron and in the State Chapter as Adah. First and foremost, “Granny” loved being with her family. She especially doted on her grandchildren and six little sweet potatoes (great grandchildren). She adored collecting butterflies. She was an avid reader, enjoyed gardening, entertaining, cooking and baking. She is survived by her daughter Judith A. Almony of Hampstead; son Jack Koenig and his wife Maria of Westminster; grandchildren Amy Almony, Shelly Peter, Derek Almony and Amanda Bange; great grandchildren Autumn, Peyton, Aubrey, Brennan, Dustin and Helena. Predeceased by brothers Beam, Pete, Pat and Buck and sister Pauline Gill. Family will receive friends at the Eline Funeral Home, 11824 Reisterstown Road, Reisterstown, MD on Monday 3-5 & 7-9pm. Service will be held on Tuesday 11am at Reisterstown United Methodist Church, 246 Main Street, Reisterstown, MD 21136. A private interment in Emory Cemetery. If desired contributions may be made to Emory United Methodist Church, 1600 Emory Road, Upperco, MD 21155 or Reisterstown United Methodist Church.